Leave it to Tropicana, the orange juice kings of the universe, to be the masterminds behind the world's first national orange juice with fiber. 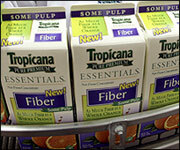 Tropicana Pure Premium Essentials(R) with Fiber will deliver a whopping 3 grams of fiber in every 8-oz. glass of OJ. That's as much fiber as is found in an actual orange. Remember, fiber isn't just for grandma anymore. Dieters, Weight Watchers followers, carb-counters and basically everyone else in the free world has hopped on that fiber bandwagon these days. It's good for you -- helping with digestion and keeping you feeling fuller longer. Woohoo! People have been saying it forever, but a new study shows that eating fish may help keep your brain younger and more alert. 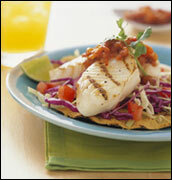 Dr. Martha Clare Morris of Rush University Medical Centre in Chicago is the study's lead author, and she thinks eating fish is a good thing. "It appears as if it's helping to keep the brain healthy," says Dr. Morris, continuing, "It does look like it's important as well in old age, or maybe just in general, for brain functioning." There is some speculation as to whether the fish itself protects the brain, or if eating fish causes people to knock fattier, less healthy foods like red meat from their diets. Ready for some new Ready Pacs? Good! 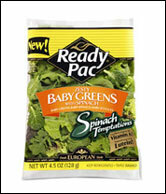 The saladmakers are debuting 4 new spinach-based blends called Spinach Temptations. Look for the new healthy spinach concoctions to make their way into markets in early 2006. ***America Takes if Off promises to be the "biggest online get fit program ever" (whatever that means). The partnership between AOL and Good Morning America will serve up tips and follow people on their weight loss journeys. ***Top secret hush-hush info coming at you from the world of Vitalicious. They're about to release a brand new cake that'll knock your socks off! Can't say much more than that it's super-chocolatey, low in fat and calories, and DELICIOUS. More on this soon... That's all we've got. HG out! Good News for Spinach Fans! Today, December 19th, is National Devil's Food Cake Day. If you ask us, it's the perfect day to whip up a batch of HG's "Yum Yum Brownie Muffins." Share this news with every human you know. Click "send to a friend" NOW! HG HEADS UP! There will be NO Hungry Girl emails next week. We're going on hiatus. Woohoo! We'll be back on January 3rd. If you miss us, feel free to visit the site and check out our massive archive of past emails.